A Nigerian journalist, Mrs Funke Osae-Brown, has narrated her horrible encounter with the South African High Commission in Nigeria. According to the journalist, who publishes Luxury Reporter Magazine, she received an invitation towards the end of January 2017 to be in South Africa on March 1, 2017 to experience the new BMW 5 Series. She narrated that, “As soon as I received the itinerary and other documents needed for my journey, I applied for the South African visa on February 13. 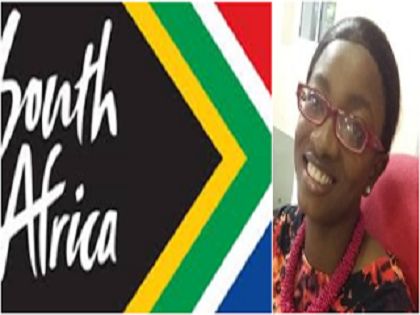 “Conscious of the many challenges that come with getting a South African visa, I was advised to apply through one of South Africa’s accredited trade partners World ‘N’ Traveland (WONTRA). “The WONTRA staff who assisted me with the application process was very courteous. She guided me through the application requirements. “At a point, she advised I get a statement of account from my host BMW in South Africa or their certificate of incorporation. “I declined to do this because I felt my statement of account and a letter of introduction from my organisation should be enough. “She also advised I get a letter of authorisation from my husband. I told her I have that already because the last application I did I was asked for it. This is a letter my husband find ridiculous to write! He argues it is a sexist requirement from an embassy. Why would he authorise a full-grown woman to travel because she is his wife, he reasoned? Anyway, I got him to give him the letter, even though I found it ridiculous too! “Since I was applying through WONTRA, I had to pay a premium price of N70,000 instead of the official N8,600 for visa fee and N22, 310 for VFS courier service. “The lady at WONTRA told me the visa should be ready within the stipulated 10 to 15 working days by the High Commission. “Based on a past experience and what others have told me, I decided to notify the few people I know handling South Africa related travel and tourism matters in Nigeria to use their connection to pull strings at the embassy so that my visa could be ready on or before my travel date. I knew I had about 13 days between my submission and travel dates to get my visa. “After 10 working days, I didn’t receive any news from the VFS. I decided to notify my contacts on the possibility of checking out my application status at the High Commission, they all told me to wait that I will surely get my passport on or before my travel date. “As I sat behind my laptop to type this today, March 1, 2017, I am yet to receive my passport from the South African High Commission. I am supposed to travel tonight. “What is most painful about this experience is it seems the South Africa High Commission in Lagos smacks of arrogance and is consumed by a nonchalant attitude. “For a country, that is promoting itself as a tourists’ destination in Nigeria, to be so rude to its visa applicants, beats me. “In spite of all my efforts and my host’s (BMW) in South Africa effort to reach the High Commission in Lagos, there has been no response from the High Commission to emails sent and calls put through to them. “It seems to me the High Commission is populated lazy staff who have just refused to understand the importance of their job to the growth of the economy of their country. “How can one explain applying for visa and you are yet to receive your passport 12 days or a month after application? “The South African High Commission can never claim to be busier that the United Kingdom or United States of America’s embassies in Nigeria. “If you apply for UK or US visa, you can be assured to get your passport within 10 working days or less. “There are people who have applied for the South African visa since February 3, 2017 who are yet to receive their visas today, March 1; that is almost a month after submitting their applications. “Delaying the issuance of my visa and that of other four journalists’ I am supposed to travel with means BMW has lost a lot of money on booking business class tickets for us, paying for our accommodation, airport pick up and drop off and food for the number of days we are supposed to spend in South Africa. “You can imagine the loss to those going on personal trips who have paid for their flights, accommodation not to have received their visas days after their travel dates have passed? “If South Africa is truly serious about marketing itself as a tourists’ destination, its High Commission needs to drop its toga of arrogance and emulate countries like Dubai and Kenya where you get your visa within two days as is the case with Dubai or Kenya that issues visa on arrival.